Amazone have been producing fertiliser spreaders since 1917 and since then the spreader and brand have grown from strength to strength to become the worlds number one choice in fertiliser spreading. Since 1917 noticeable milestones were the market leading ZA-U model, Amazones first twin disc machine introduced in 1980 followed by ZA-M in 1989 which reigned as number one until its replacement in 2013 with the ZA-TS for high output and wide spreading widths and the ZAV in 2015. 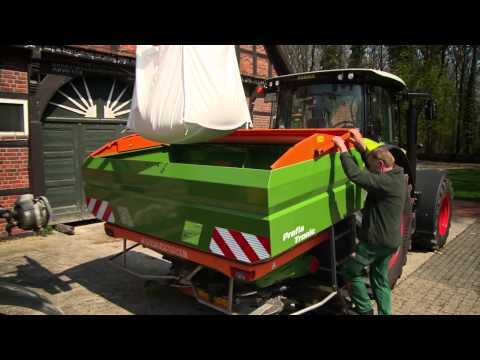 Today the ZAV mounted spreader is available in hopper capacities from 1,400 to 4,200 l and it impresses with its high operational speeds of up to 30 km/h. Thanks to a high spreading capacity of up to 390 kg/min and working widths of up to 36 m, exceptionally high acreage outputs are achieved. The accurate weighing system, the precise AutoTS and ClickTS border spreading systems, the comfortable Argus Twin technology, as well as the many other additional options, make these fertiliser spreaders possibly the most modern in their class. When it comes to electronics Amazone are in a league of their own, with a myriad of options to suit modern farming practices and Precision Farming programmes. These electronic systems have become an important part of intelligent crop production, allow considerable savings of assets and help to improve the exploitation of yield potentials. At the same time they save the environment. From machine specific intuitive terminals to comprehensive terminal for full GPS control of application, section control, steering and linked to precision farming systems. Full ISO integration means that these functions can be simply accessed using the control panel in the tractor without the need of a machine specific control box.